Most churches today have websites, which are essential for ministering in today’s digital world. Many churches’ sites, however, are outdated and hurting their ministry. If your church hasn’t updated its website recently, its website is likely outdated and less effective than it should be. Here are five ways an outdated church website will limit your church’s ability to reach people and minister to them. Non-responsive websites, which don’t scale to accommodate visitors’ screens, are quickly becoming unusable. With how common mobile devices have become, websites that can’t be read on these devices are now obsolete. According to ComScore, over 75 percent of American Internet users access sites on both desktop computers and mobile devices. Most significantly, 21 percent of Millennials don’t use desktop computers, relying solely on smartphones and tablets to access the sites they visit. To reach the growing number of people who don’t use traditional computers, your church’s website needs to be responsive. 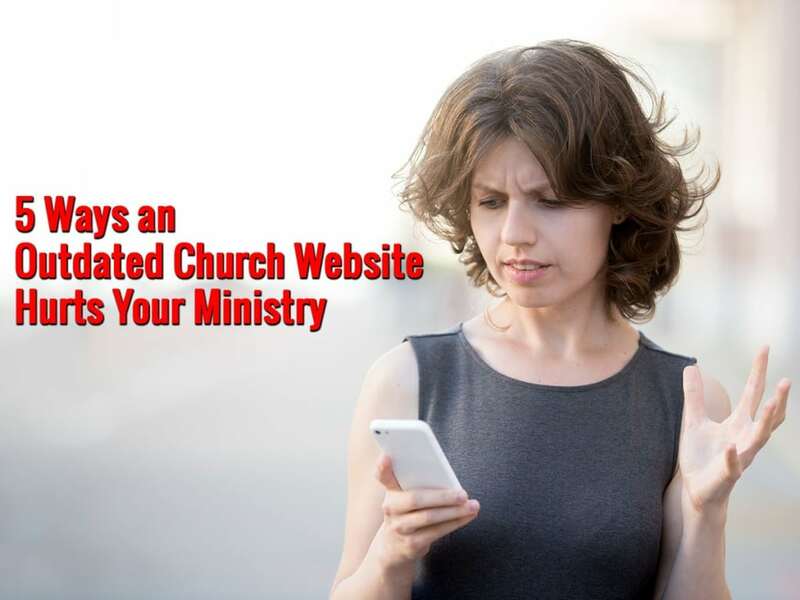 Because visitors won’t scroll through a non-responsive site on their mobile devices, they won’t see most of the content on the site if your church’s site isn’t responsive. They may miss everything from your latest blog post to Sunday service times. A responsive web design will adjust this content to easily fit on visitors’ screens, whether they’re 14-inch laptop screens or 4.7-inch iPhone screens. You church’s website must be responsive / Mobile Friendly. See if your site is mobile friendly with Google Mobile Friendly Test. As people become more and more accustomed to online banking, many churches are beginning to offer members ways to give online. Many members find online giving an easy and convenient way to give their offerings to the church, and some online giving solutions can increase donations for churches. To accept online gifts, your church’s website must meet the current security standards. If the site isn’t secure, members may have to be routed through a third-party site that’s cumbersome and doesn’t contain your church’s branding if they want to donate online. There are several aspects to website security, but they all start with a reliable web design that’s built using the latest code (HTML5). In addition to making your church’s site look good, updating its theme to one that’s built to the latest standards in programming will also provide the groundwork for incorporating a safe and secure online giving solution. When a visitor first comes to your church’s website, you have about 3 seconds, at most, to grab their attention. The easiest way to get–and keep–their attention is with visuals: photos, graphics and videos. Therefore, your church’s website should be rich with images. If it isn’t, a high percentage of visitors may be bouncing off of the site. Over the past few years, web designers have found creative ways to naturally incorporate images into church websites. Themes today don’t just incorporate images into the homepage and all other pages. They transform the entire site into a visually enticing design, creating a consistent color theme and branding that captures visitors’ attention. Everything from a custom header to a unique color theme can be used to engage visitors. Along with still images, your church’s website should also feature videos. ChurchDev, helps churches both use promotional videos and live-stream videos of sermons on their websites. ChurchDev’s dual approach is especially suited for churches, as it showcases what’s going on with the promotional videos and ministers to people who can’t attend service by live-streaming sermons. The promotional videos will quickly capture visitors’ attention, and the streamed sermons will engage those who want to go deeper. Printed church directories are being replaced with online ones, which are more convenient for members to use and easier for churches to maintain. Many older website designs, however, don’t have built-in directories. These designs were made for simple websites, not to be robust online ministry tools that incorporated online giving and member directories. While it’s not impossible to connect with others at your church without an online directory, including a membership directory on your church’s website will help members connect with one another. People today are used to finding each other on social media, so looking up contact information in a private, member-only directory is natural to them. Most churchgoers today would prefer to look up another member’s information online than search through a printed directory. Additionally, because members are free to update their information in an online directory at any time, they tend to be more accurate than ones that are printed only once per year. For churches hoping to reach new potential visitors through search engine optimization (SEO), having an updated site is of the utmost importance. Along with keywords and links, search engines also consider criteria such as responsive design, page load speed and average time on site when ranking websites in their results. Factors like these are significantly affected by a website’s design, and your church’s site will lag behind others if its design is outdated. Many churches don’t update their site for one of two reasons. They either aren’t sure how to, or they think it will be too involved and time-consuming. ChurchDev, however, has made the process simple and easy. ChurchDev will copy over all of your church’s existing content, so nothing will be lost when updating your church’s website. We’ll take care of ensuring all the content is still where it’s supposed to be, while giving your church a new, enticing look. Our designs are responsive and secure, and we make it easy to incorporate images, videos and membership directories. We also help with SEO, making ChurchDev a great choice if your church’s website needs updating. Once it is updated, Our drag-and-drop page builder lets you easily add new content even if you have little or no technical web knowledge. To learn more about ChurchDev and whether their services can help your church’s website, chick here.